Menu Options are exactly that: options in a menu that you offer to your callers when they want to contact you. These options are a visual way of letting your customers guide themselves inside your telephone menu. Now you can configure your Menu option. A configuration form will show for you to fill the required data. Enter the name of the option that your callers are going to see. 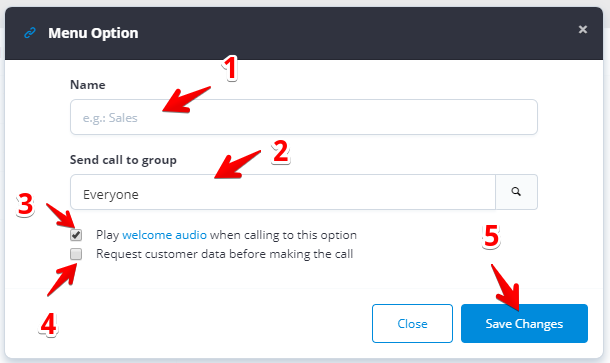 Select the group of agents in charge of handling calls arriving to this option. Check if you want Toky to play play a greeting audio when calling to this option, if not, go straight to ringing the agent's phones/devices. Check if you want the visitor to leave contact information before making the call. Now the option will be live in your Toky profile.